Only 50 percent of kids born in the 1980s are earning more than their parents, according to a new study that puts most of the blame on the narrow distribution of economic gains. 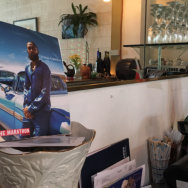 The widening gap between rich and poor Americans has pushed the chances of children earning more money than their parents down to around 50 percent, economic researchers say. That's a sharp fall from 1940, when 90 percent of kids were destined to move up the income ladder. Describing an American Dream that for many has faded into a less plentiful reality, Stanford economics Professor Raj Chetty said in a news release, "It's basically a coin flip as to whether you'll do better than your parents." The downward trend held true across the U.S. — and the steepest declines were seen among middle class families, according to Chetty and his fellow researchers in the Equality of Opportunity Project. 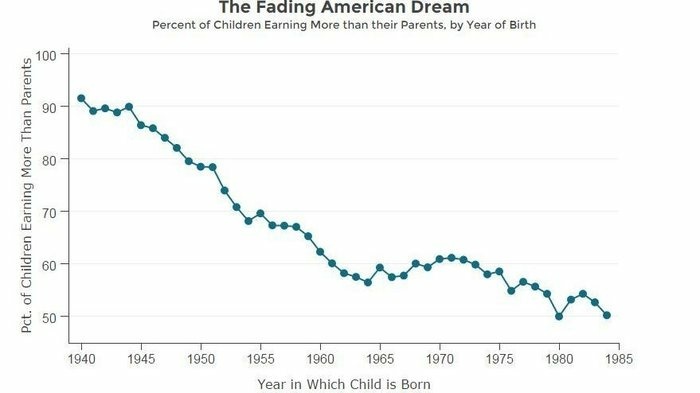 The percent of U.S. children who go on to earn more than their parents has dropped sharply since 1940, when the rate topped 90 percent. The study detailed "absolute income mobility" from one generation to the next by comparing the household income of 30-year-olds to what their parents made at the same age. The Stanford study used data from both the U.S. Census and anonymized Internal Revenue Service records to compile stats for people born between 1940 and 1984. 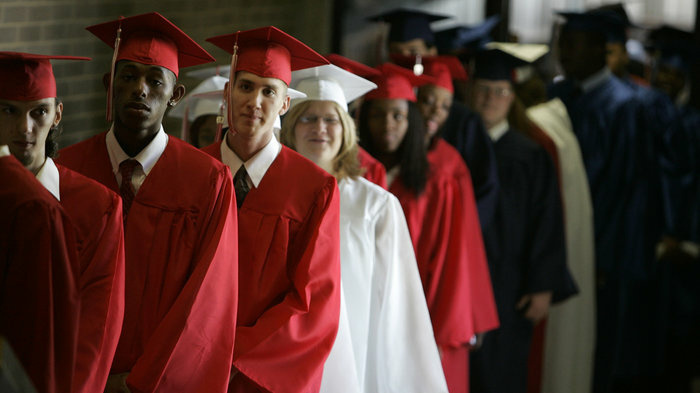 Over that period, it became less likely that children born in every U.S. state would out-earn their parents, with the largest drops in upward mobility seen in Michigan, Illinois and other parts of the industrial Midwest. To unravel what caused the decline, the researchers tinkered with two variables — Gross Domestic Product and the distribution of economic growth. In simulations, both stronger growth and more broadly distributed gains had positive effects — but the broader gains were far more influential. "When the economic growth rate was raised to the higher levels experienced in the 1940s and 1950s but the economic distribution mirrored today's highly uneven landscape, the estimated rate of absolute mobility rose to 62 percent. "In contrast, when the economic growth rate was held at the low levels of 2 to 3 percent of recent decades, but the pieces of the economic pie were distributed more evenly as it was in the mid-20th century, then the fraction of children who ended up doing better than their parents climbed to 80 percent." "The finding of this study implies that if we want to revive the American Dream of increasing living standards across generations, then we'll need policies that foster more broadly shared growth," Chetty said. 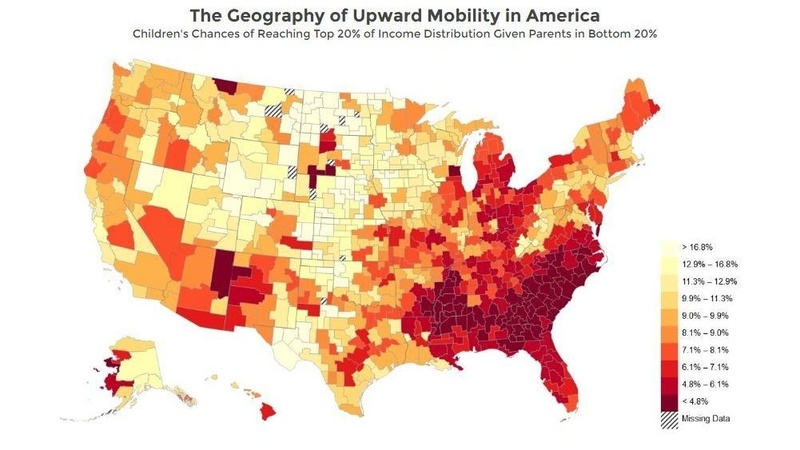 A map of the U.S. shows children's chances of moving from the bottom fifth of income levels to the top fifth. Results also vary depending on where children are raised. As their map of metro and rural areas in the U.S. shows, the researchers found large areas where kids had markedly better chances of moving from the bottom fifth of income levels to the top fifth. The study also found that children who are moved to a better environment get a sharp boost in their chance to reach economic success — and that the earlier such a move takes place, the greater the effect. Some cities have been able to buck the trend, with researchers citing Salt Lake City and Minneapolis as two places where children have a good chance to emerge from poverty. Such cities tend to share important qualities, the economists say: "lower levels of residential segregation, a larger middle class, stronger families, greater social capital, and higher quality public schools."